Worldwide: 81.51 million, all versions combined (as of September 30, 2010). The Game Boy Advance, commonly abbreviated as GBA, is a 32-bit handheld video game console. It was manufactured by Nintendo. The predecessors to the Game Boy Advance were the Game Boy and Game Boy Color. The Game Boy Advance was eventually succeeded by the Nintendo DS. The Game Boy Advance was released in Japan on 21 March, 2001. Nintendo released it in North America on 11 June, 2001 and for Europe on 22 June, 2001. The Game Boy Advance SP is one of the two Game Boy Advance variations, released in February 2003. It is similar to the original, but it has a "clamshell" design, meaning that it can be folded to open and close. The Game Boy Advance SP has a rechargeable battery, and it does not run on two AA batteries. 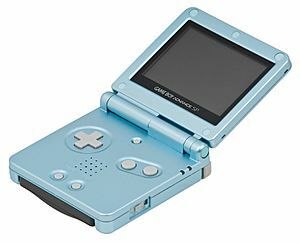 The Game Boy Advance SP has a backlit screen, meaning it has a bright screen (older versions of the GBA SP have a frontlit screen). The Game Boy Micro is the size of a Nintendo Entertainment System controller. The control pad is similar to the Nintendo DS Lite system. 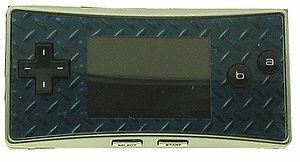 The Game Boy Micro is one of the two variations of the Game Boy Advance. It is smaller than most handhelds and is designed to fit inside coin pockets. 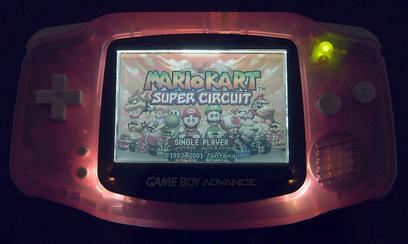 It retains a rechargeable battery and backlit screen from the Game Boy Advance SP. The Game Boy Micro removed compatibility with original Game Boy and Game Boy Color games. It also is incompatible with the Nintendo e-Reader. The Game Boy Micro also has a removable face plate for alternative designs. Screen: 51 mm / 2 inches, backlit with adjustable brightness. Battery: built-in rechargeable lithium-ion battery. It has up to five hours of battery life with top brightness and sound and eight hours with both features on default. The Game Boy Micro has a switch on its right side to adjust the volume. If the player presses the L shoulder button, it can be used to adjust the backlit screen between five different brightness levels. Game Boy Advance Facts for Kids. Kiddle Encyclopedia.